My Cannondale family expands again. This time I picked up a late 90s “flaming yellow” F700. The bicycle—like Carrie the Commuter Bike—is comprised of a CAAD3 frame, but this one is the mountain bike version. Yes, finally I own a real mountain bike! This is not to slight The Tank, my virtually indestructible Raleigh M300 that is sitting in my friend Adam‘s garage in California right now. It’s just that without front suspension, The Tank wasn’t the most optimal for really gnarly singletrack. Ditto for The Tanks’ 33 lbs. or whatever it weighs. In contrast, this F700—despite being equipped with Cannondale’s proprietary HeadShok suspension—only weighs 25.2 lbs. That is one pound lighter than the Reynolds recumbent and even 0.2 lbs. lighter than Carrie when the latter is equipped with a rear rack, lock, pannier, and rat-cage pedals (as she is now). The bike is mostly Shimano Deore components, though the previous owner, Marieke, upgraded quite a few things including the saddle, seatpost, quick-releases, tires, etc. She was selling the bike due to moving from Golden, CO. Due to the wonders of Craigslist and depreciation, the bike only cost me about $25 more than I invested in The Tank back in 1996 despite being a much more competent machine. As I write this, I have yet to take the bike for a spin off-pavement since the trails around here are still more appropriate for snowshoeing or x-country skiing. But unlike for skiing (which I’ve already squandered away half of the season due to not procuring equipment in time), I am now prepared for mountain bike season. Good thing because mountain biking opportunities are brilliant out here! These were the initial components when I first purchased the bike. Again, the previous owner, had upgraded many of the stock components. The overall bike weight with the components above (and water bottle cages) is 25.2 lbs. I am guessing this is about 5-9 lbs. lighter than The Tank, even though Cranky has front suspension. 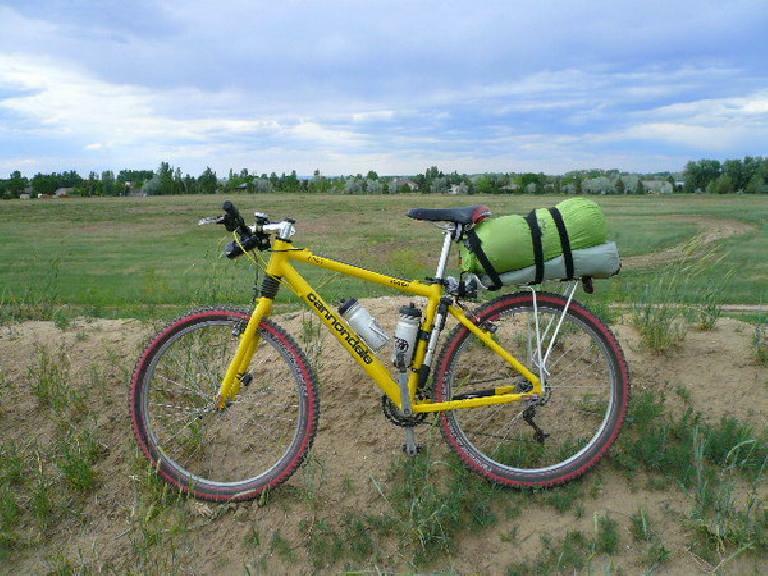 Despite being a little outdated, Cranky and I completed the inaugural, self-supported 2008 Tour Divide Canada-Mexico mountain bike race in 6th place out of 17 starters. We were just the 11th in the world to have successfully time-trialed the entire stretch of the world’s longest mountain bike route, the Great Divide MBR. Cranky is now retired from racing, but we still hit some local trails now and then. I just stumbled across your website. Its a fun read. Your cannondale is a 1996 version. I have a 1995 F700 and have studied the older hardtails a lot. By 1997 the F700 was dumbed down to CAAD2. The crank is branded coda but is made by sugino. Bottom bracket is shimano UN51 68×110. I replaced some parts and you can get under 23 lbs without much trouble. They are awesome bikes even by todays hard tail standards. I have those same tires on My 2001 F700 disc. They work great, but when they wear out I wonder if I could fit 2.3 tires on that. My bike is so light and and great climber. I compare it to driving a Porsche compared to my friend’s big heavy full suspension rig. Nice bike you found.